What makes a great motorcycle vacation? Is it how many times you experience joy, excitement or wonder? 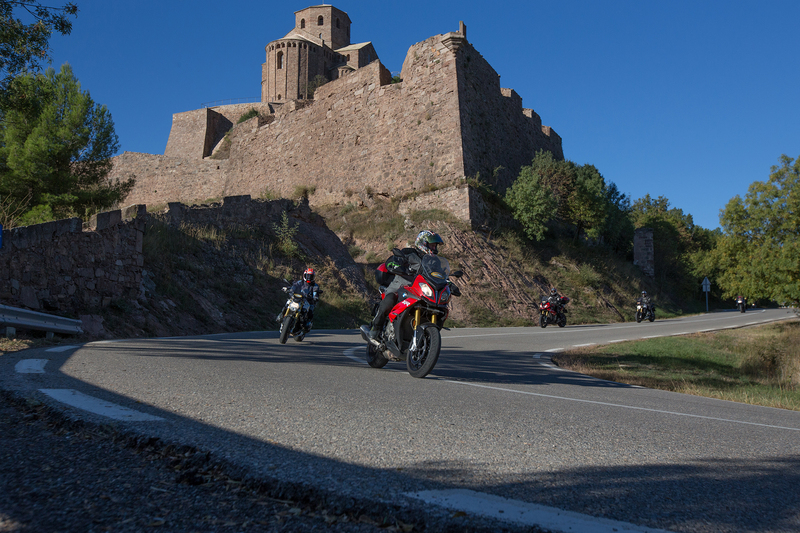 Some riders come to experience the brilliance of a MotoGP circuit, but what about the sport touring? Is it only about the ride itself or do awe striking views, eye rolling delicious flavors count? Can you keep score by counting how many times someone says the word “amazing” or you find yourself gasping for breath because you are laughing so hard. What of the fellowship with riders forged in the crucible of shared moments? Do you keep count by how many tears fall when you have to say goodbye? When a tour operator launches a new tour in a fresh destination the question of comparisons is unavoidable. Leod Escapes already runs motorcycle tours with track time in four other countries. Riders have been treated to curves on the California coast, the Austrian Alps, Italy’s Tuscan Hills and Australia’s Omeo Highway. Adrenalin has been served up on circuits like Sachsenring, Laguna Seca, Mugello and Phillip Island. While the Spanish Pyrenees to Aragón had been the most requested tour in a poll held in 2017, would it be successful? And how would you define that success? In 2018 the first tour was run. As any Leod Escapes employee will tell you, success is defined by perfect motorcycling moments. Those memories of your trip that last a lifetime. The tales that are told again and again. These become the shining points of light when the darkness of the world threatens to consume us. It could be that perfect three turns you rode on Col de Tourmalet before accelerating into an impossible vista. It could be seeing the dawn light on the 14th century palace you slept in last night. It could be dragging your knee for the first time in Marquez Corner at Motorland Aragón. It might be laughing with fellow track riders while drinking a curious green liquor, in a cave restaurant frequented by MotoGP riders. These moments are personal and different for every rider but there’s no mistaking that moment of clarity. You pause and know this is a special time in your life. These authentic moments can not be manufactured. A good tour operator knows, all you can do is carefully set the stage. The right route, the right time of year, the right hotels, the right bikes, the right personnel, and the right attitude increase the probability that these magic moments happen. Barcelona is the capital of the Catalonia part of Spain. A prosperous region with it’s own customs and language. This vibrant port city has always been a home to a wide variety of people. A centuries old mixture of art, culture, education, and business all done with a festive spirit. Barcelona is always changing but it’s personality is consistently energetic and fun. Walking past roman ruins in the gothic quarter, seeing the massive statue of Christopher Columbus at the end of Las Ramblas you get a feel for the history beneath your feet. Taking in some of the architect Gaudi’s work you get a feel for the how Barcelona likes to combine clever with fun. The people of Barcelona have been consuming chocolate the same way since Cortes brought it back from the “new world”, they drink it and it’s amazing. Barcelona has grown to be one of the top travel destinations in Europe and many riders choose to come in a day or two early. While the city is diverting, the overall tour happens across the historically allied regions of Catalonia and Aragón. Massive mountains, medieval villages and vast open country dotted with castles greet your eyes around every turn. This is a trip across a forgotten empire with 1000s of years of history. It must be noted that Catalonia has a long troubled relationship with Spain and it’s capital Madrid. Over the centuries this relationship has ranged from a friendly soccer rivalry to brutal repression. At the moment the future of Catalonia remains uncertain. The majority of people in the region would like to separate from Spain. Referendums on this desire have been held and unfortunately the will of the people go directly against Spain’s financial interests. While Catalonia only represents 6.3% of Spains territory and 16% of its population, it represents 20% of Spains tax base and 25% of its exports. While the tension is plainly evident, with independence flags flying everywhere and yellow ribbons displayed for jailed Catalan politicians outnumbering birds, all parties concerned are desperate not to resort to violence. It still remains a safer destination than the USA. There’s a feeling though, that you are riding through a region that’s about to turn a page in history. The Pyrenees Mountains on the border between France and Spain are laced with roads made for challenging and scenic rides. These “Curves Curves Curves” grace the Tour de France every year. Hidden canyon runs and narrow pass roads that are frequented only by sheep herders, and the odd motorcycle or bicycle rider. The routes vary from 160 to 250 miles a day but regardless of the mileage count, it’s a full day of riding everyday. Leod consults with local guides to make sure each day is an adventurous curve quest and the group is rolling into the hotel a good hour or two before dark. Low traffic is a Pyrenees joy factor. It rarely gets noticed while the fun is happening. It’s only at the close of the day, over a few drinks, that you begin to reflect that one of the reasons you had so much fun is because no one else was on the road. It makes one wonder what the Alps used to be like 50 years ago. If the summer vacationers are gone then what’s the weather like? By early October there is a slight crispness to the air in the morning that’s gone by mid day. Throughout the entire tour, the temperature rarely gets over 28C/82F, even on Aragón. There’s plenty of daylight and little chance of rain. The sheer riding quality of the routes themselves are motorcycle dreamland craziness, on par with anything you’d find in the Alps. EU funding, winter ski tourism and the Tour De France keeps these routes in good repair. When the sun streaks across a steep green valley, as you dive down the curves, it’s pretty clear you’re in the right place at the right time. There’s nothing more sincere, than the love of good food. All dinners are included on this tour and the hotels do serve up an array of local delicacies. No matter where you are in Spain, you’re never far from it’s signature ham/jamon. It’s more than a source of national pride around the world, it’s a daily staple that is everywhere. One wonders if Spain is secretly breeding pigs with 6 hind legs. Spanish red wine is called “Tinto” and it’s a very dark red and naturally goes very well with Jamon. The renowned “Tapas” which means “little plates” are more Basque than Spanish but their popularity in all Spanish cities is evident. Barcelona is your best place to enjoy tapas on this tour. Another reason to come a day or two early. What makes special moments happen with tapas? Tapas are just bar food but chefs can get quite creative. The advantage here is you can try just little bits of many different tastes until you find the dish you must order 2 more of because it’s amazing. Pintxos is the same idea but centered on what flavorful creation you can fit on small piece of bread with a toothpick. Dinner starts late in Spain, which usually means your fellow riders have thankfully showered and gotten two rounds in before dinner. Breakfast is usually a light meal in Spain but Spanish hotels think differently. It’s quite evident that the upscale hotels on this tour, really want to make sure guests check out stuffed to the gills. A good meal in a new place brings people together and a few bottles of Spanish wine makes them friends. Meals on a tour with fellow track riders is just as much about the company as the food. Okay so maybe it’s a little touristy but there’s just something cool about parking your bike in front of an edifice of the past and then staying there for a night. In 1928 Spain set up the Paradors program in an effort to preserve some of it’s historical building by turning them into hotels. It’s amusing how parts of these old stone structures have been adapted to serve the shifting hospitality tastes of modern generations. The result ranges from quirky to downright majestic. It does add to the cost of the trip but the experience is well worth it. Of particular note is the Parador Hotel “La Concordia” in the town of Alcañiz, not far from Motorland Aragón. This was a fortified castle, convent and a palace before becoming a Parador in 1968. This fortress was historically pivotal in the history of Aragón in 1412. A grand agreement was reached here after King Martin died without a direct heir. Representatives came from far and wide to reach “La Condordia” and select a successor without the need for bloodshed, hence the name of the hotel. When you stay in the Castle of Cardona, you are staying in a vital piece of Catalan history. There’s been a fortress on this hilltop since 886. The castle has grown over the centuries but was never taken by force, even after considerable bombardment in the 16th century. This is a massive fortress. It’s an authentic pleasure to climb it’s towers, feast in it’s halls, and hear about it’s most tragic ghosts. Which turn on Motorland Aragón will be your favorite? This is a massive facility on the high and dry central plains. It’s fast, it’s technical and when you’re on a new BMW S1000RR the circuit starts to feel smaller after your 4th session, mainly because you get used to opening the throttle so much. This is a circuit that is meant for a liter bike. For some that special moment has everything to do with 2 time WSBK champion Troy Corser. Directly learning from Troy and getting easily passed by this road racing legend goes way beyond just getting him to sign your shirt, though there’s plenty of that as well. Great photography is on hand so you don’t have to just try to remember that favorite turn, you can get of photo of yourself in it. Getting on the gas entering turn 17 onto the front straight is certainly a howl in the helmet fun spot. Beware, you’ll need to keep an eye out for that famous Aragón wall. While riding, your eyes will be bouncing from apex to braking point, at which point the wall will be behind you. Take a good look around the paddock during your track days at Aragon. A track day in Spain is more than just a local affair. Your track riding brethren come from all over Europe to ride this circuit and you’ll see some big money in paddock and hear a many different languages being spoken. Relax, the default among strangers is always English. Aragon like any MotoGP circuit, is smooth wide and safe with lots of run off areas but will it be your favorite? There’s only one way to find out but it will certainly be the fastest course you’ve ever ridden. The back straight is mind bending. If you want to have that authentic moment in a foreign country then you need local expertise. It really helps if that local guide shares your passions in life. Sergi “Slim” and David are your local connection in Barcelona. Both speak English, Catalan and Castilian Spanish. They know the roads, they know the food, they know the language, and most importantly they are track riders like you. They understand your obsession. This is not a normal motorcycle tour that travels at a pleasant tour bus pace. You’re riding with a group of track riders. In general that means riders that are smoother, safer and faster because they’ve got the skills. When the road says “Fun!”, those who want to answer the call head to the front and follow Sergi as he wicks it up. Sergi doesn’t ride at an unsafe speed, as a track rider he just has greater skills. Skills that allow you to follow along at a pace you enjoy. Cat MacLeod your overall tour operator, rides in the middle of the pack keeping an eye on turns and keeping the group together while David does amazing things with the luggage van around corners bringing up the rear. Whatever speed is going make you smile that’s the speed you go. There’s no fear of not being fast enough or being stuck in a dull mule train or always having to watch behind you to make sure the next rider makes the turn. Everyone regroups when complicated turns have to be taken to stay on the route. This style of tour riding alone increases the probability of more “Oh damn this is awesome” moments. Up at the top of say… Col D’Aubisque, Sergi waves you into the small parking lot after you’ve just railed the tight twists at YOUR pace. Looking out over the expansive vistas of the Pyrenees with only the sound of laughter and the ticking sound of cooling engines, you’ll know, this is why you left home. The track riding community is the same all over the world. It’s a supportive tribe of lunatics who understand the thrill of speed and mental peace that comes from chasing apexes on rumble strips. A Leod Escapes tour group is never a group of strangers. It’s an enabling support group for track riding addicts, ready to bust loose on the ultimate playground. While every tour is different because of who arrives at the airport the ultimate outcome in Spain is the same. You’re going to have some insanely fun days and probably some wild nights because you’ll be spending 10 days with people just like you. In a word, absofuckinlutely. The 2018 Spanish Pyrenees to Aragón was a pure success. Leod’s”Track & Tour” recipe is simple but it’s the authentic ingredients of each nation make the flavor of each tour so different. Direct comparison is impossible. All the planning of the right elements is a key factor but it’s the riders who come on these tours that make the dream real. We all return home, regaling our friends with tales and savoring the memories of those perfect motorcycling moments. Wanna go for a ride?